It’s hard to get across what TepFactor is without launching into a full explanation of exactly how it works, so that’s what I’m going to do shortly. 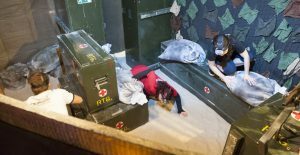 But to try and describe it in a few sentences, it’s more like The Crystal Maze attractions in London and Manchester than an escape room, though it’s completely self-guided with every player participating in every game. If you’ve played BodaBorg, I’ve heard it’s like that, except where BodaBorg says “some physical activity is required so wear comfortable clothes”, TepFactor says “we have changing rooms and showers, bring your gym gear”. “Tep” translates into English as “heart”. It works like this: there are twenty individual rooms broadly categorised into physical, mental, skill and patience. 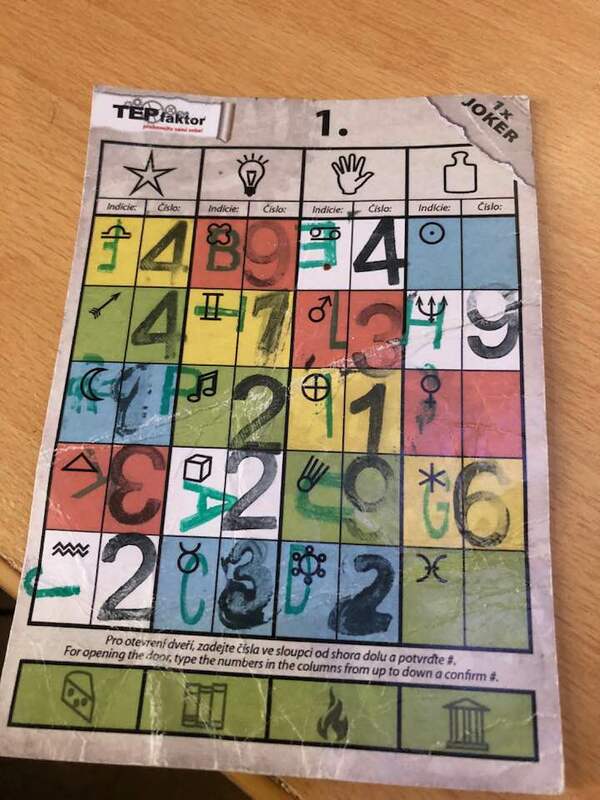 Each time you beat a game, you get a stamp with a letter. Using charts on the walls you can convert the letters to numbers. Get all five numbers in a category and you can use that code to unlock an extra game. Beat that game you get four code words. Beat enough of those extra games and you can unlock the final room. Beat that, open the chest and win! We didn’t win. We did beat 18 of the 24 games available (one was out of order) in our four hours there. To give you a flavour of it: we primarily lost because none of us could mentally add up five 3-digit numbers, nor did I have the upper body strength to negotiate my way from one swinging tire to another. In terms of our trip to Prague, it had the best parts and worst moments of any game we played. The rest of this article is going to “spoil” a lot of the actual content of TepFactor. Far more than I would for a regular escape game. There’s a few reasons for this, but mainly it’s going to be quite a trek for most of the people reading this to try out so you’ll want to know a bit more about about it. In addition, the company are not sensitive about spoilers at all. In fact, they go so far as to offer Go-Pro hire so you can film your entire experience and put it on YouTube. Lastly, looking through those YouTube videos there were a lot of games we saw online that were not there when we played and vice-versa. So it appears they change games up a lot. Note that we didn’t take the Go-Pro option, so all the photos in this piece are publicity images or borrowed from elsewhere on the web. 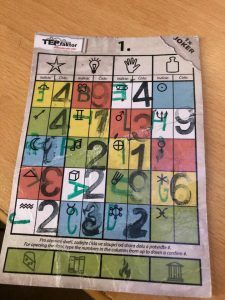 So lets start at the beginning – we went to TepFactor (then known as TepFaktor) during our trip to Prague. But the game is not in Prague. They had a smaller game in the city centre that has since closed, but the main branch is in Chotilsko, which is a tiny village about an hour’s drive through the countryside from Prague. There is a bus that runs every hour from the main bus station in the city centre, though be aware it only runs every two hours at weekends. This caught us out, and we ended up getting an Uber there which was fine and very cheap, though bear in mind it won’t be an option for the return journey. On arrival you sign up at reception, get a locker key, scorecard and a wristband that gets you into the games and can also be used for buying stuff from the little snack stall. On top of all that, it’s also a timer. There’s no time limit to the game (at least, until the venue closes for the day) but you pay per person and per hour spent. We spent four hours in there and that seemed like a sensible amount of time – I think had we been good enough to complete all the games we would have by then. I wouldn’t suggest less than three – there’s a lot content here. I think their record is about two and half hours. You watch a briefing video and get introduced to the very light pirate theme. It’s all subtitled, 12 minutes long and not as funny as it thinks it is. It also explains the structure of the game and some of the basic, universal rules: don’t touch any red surfaces or you lose. Everyone on your team has to simultaneously press two buttons each when you enter each room to start it, and you win when you all get to the end of the room and press the buttons there. That unlocks a box with a stamp that you use on your scorecard. Each room has a time limit that’s displayed on a box in the corner with a green light. If you run out of time, or do anything wrong like touch a red surface, the light goes red, a buzzer sounds, and you have to leave and start again. If there are blue buttons along the way you have to press those too. After that you are let loose! You’ll immediately notice the Pirates of the Caribbean-esque music in the outer areas, and despite the 25 games hosted here the outer part feels quite small. It’s just a big loop with a lot of doors. It reminded me a bit of the old Cyberdrome Crystal Maze games that used to exist in places around the UK – it’s the same concept of having multiple teams in the same shared area, that go into individual game rooms separately. But whereas that let you navigate four different themed zones, this felt a little more bland. It’s very well decorated but it’s more designed for function that form. It feels odd because there’s a huge reception, eating, briefing, changing and accommodation area, all done up on theme. It’s a shame not to use more of it for the game. So we look around and see a door with a green light next to it – that means its empty. We hold our wristband up to to the sensor and it unlocks and we find our first game: it’s a big steep slope you need to get to the top of. It seems like it was originally designed as a teamwork game but they must have decided it was too difficult for smaller teams as they had added a network of tunnels you could crawl through instead. It took a couple of tries to figure this out but we swiftly had our first stamp and were off! If you look at the photo you might think “why not just use the ladder?” – it’s red, you can’t touch it! As you’ll note from the images on these pages, the games are quite sparse: again, they’re designed for function rather to fit in with any theme. The whole thing is very mechanical and utilitarian. There was one really jarring exception to this, where you enter a room done up as a WW1 bunker with sound effects going off and you have crawl and climb through various things while solving a puzzle. It was one of the better games but was a weird change from black and red cushioned surfaces! In most games it’s obvious what you need to do, it’s just really hard to do it. In a few games, you need to work out the trick. In some others you need to persevere. In some you just need the strength or agility or you’ve got no chance. The games err massively on the physical side of things, most of them involving a decent amount of physical activity. There are a couple of purely mental/puzzle games but they’re rare. So over the course of four hours we crawled through massive inflatable balls, manipulated huge table mazes, crawled on the floor a lot, did a bit of football and netball, balanced over a rotating log, navigated some “monkey bars” (that were also clearly to hard so they’d added a ladder to climb over the top), solved puzzles with dice and pulled ourselves through the middle of a bunch of elastic wiring while avoiding the floor. We had beaten 16 of the initial 20 games and one was broken, but they had put the solution letter on the door (at least that’s what we think it said, this sign wasn’t translated!). Three games had left us stumped. And that was too many. You get one “joker” which you can trade in to beat a game for free, but that’s it. One game involved winching a platform on which team members stood one person at a time across a chasm, and then balancing carefully on some platforms at the end, not nudging them too far one way or the other or you lost. It took twelve goes to figure out but we got it eventually. But the two remaining games were another matter. One involved climbing along tires on a wall, then onto swinging tires, to get to another wall, then get over. My two team mates could manage it, but this was one of the last games we tried and my upper body strength was shot to bits by then. We could have used our joker, but we were also stumped elsewhere. Embarrassingly, it may have been the room closest to a regular escape room experience. There was a sewing machine in the middle, which someone had to operate to keep the lights on (yes really), then there were racks of clothes. A symbol appeared, and it seemed we had to gather the clothing with that symbol on. Each had a three digit number on. There was also a keypad that took a four digit code. There seemed to be five items of clothing with each symbol so we assumed we had to add them up. But nine tries and nine failures later we were lost. Either we had misinterpreted it entirely or lost the ability to do mental arithmetic. The latter isn’t as far-fetched as it seems as remember we were essentially about three hours into a gym session by then. Maybe we would have plugged away a bit more (or used a joker for one game and brute-forced the final digit for that category) but at this point we had unlocked three of the four “boss” rooms and this is where the game really started to fall down for us. One of them was good and straightforwards (if weirdly not really “resetting” between games meaning it could be really easy or really hard depending on the state the previous team left it in), but the other two were baffling. The first involved a fireplace, but you would lose the game if you opened it. And then there were water pumps you could use to move water from place to another… to seemingly no effect. The second game included a few paintings and bookshelves that were covered off, with literally no way to input anything. There was a sealed off door, and for an escape game fan it’s really weird to go “maybe the solution is just to force this door open with as much strength as possible” and know that that could well be right. But either it wasn’t or I’m a weakling. Both of these games had “clues” on signs, and all the signs were in both Czech and English, but it was clear from everything else we had seen these were very quick translations (I lose track of the amount of times we saw the phrase “at own risk”). Maybe they were offering a subtler clue that was lost in translation. On reflection I wonder if the latter one was trying to clue “art gallery” and “library” and the answer was to just be quiet for the entire game… who knows. That’s sort of the other downside here. 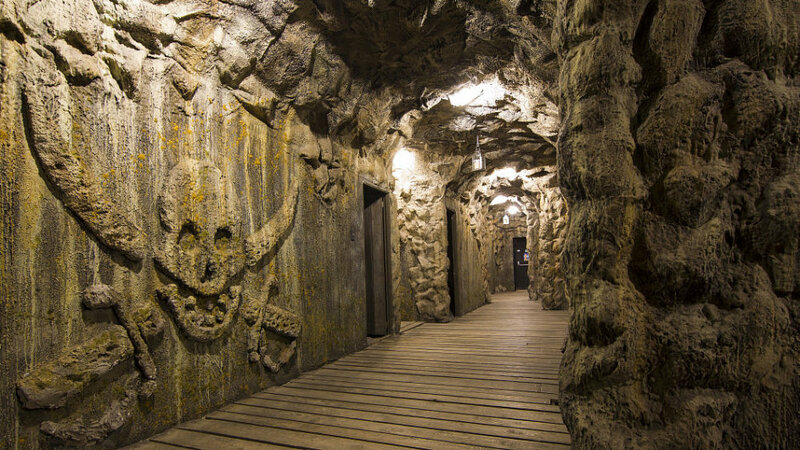 The entire game is signposted and clued in Czech and English and totally playable, however unlike pretty much every escape room in Prague, the level of English from the staff is limited. They only had one English speaker there when we played, who we had to ask for on arrival and she struggled with us a bit (though of course, her English was far better than our Czech). They also had staff were wondering around and chatting to teams, and presumably giving out some hints, but they never approached us (and vice-versa). So once we got stuck we sort of paid and went home. I can tell you that the final game, if you reach it, involves navigating rotating platforms while not being hit with giant inflatable balls. I can tell you this as, in a nice touch, it’s out in a public area, so winning teams can have their final victory witnessed by other players. It also looks a lot of fun and it’s shame we didn’t make it! A last thing to note is player numbers and timing. We started early and there were very few others players there at that point, we had the pick of any games, pretty much, and could come right out and try again if we lost. About half way through, a large corporate group joined with about ten other teams and suddenly the place felt very busy, we had to queue for games, and if you fail a game and a team is waiting outside you have to go join the back of the queue (although some players were ignoring that rule). Where this really becomes an issue is that some games are just harder than others. Of the 18 games we won, we beat 13 of them with 3 tries or fewer. So what happens towards the end of the day is that all the teams have cleared out the easy games and you start getting queues for the harder ones. It’s not a huge problem, we were never waiting more than a few minutes but we certainly enjoyed it more when it was quieter. 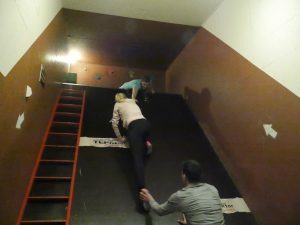 I would absolutely recommend that any escape game fans, as long as you’re at a decent level of fitness, make the trip to TepFactor. It is a big time investment – four hours playing plus an hour of travel each way means effectively giving up half a day. 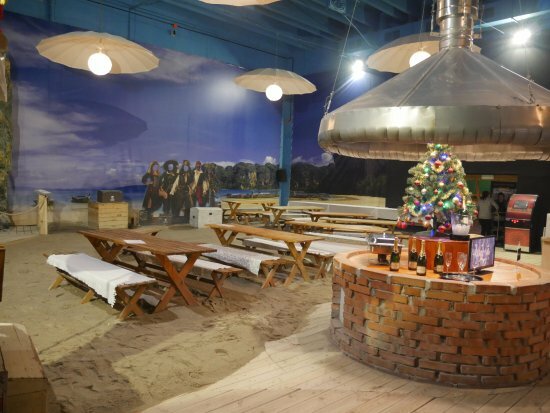 Weirdly enough they do offer onsite accommodation (in log cabins on a fake sand “beach” and sell food and drinks). I’d actually imagine it’d make a really fun hen/stag do activity – far better than actual escape rooms – as while you’re in teams of 2-5, you actually get to see the other people in the group and even swap strategies and tips (or get very competitive and refuse to!). But it’s just so unlike anything else you’ll ever do it’s really worth trying out. Perhaps the best thing about it, and presumably the reason it seems to do so well hosting corporate events, is that it really needs teamwork. Everyone has to check in at the start. Everyone has to check out at the end. So you need to get everyone through the room. It doesn’t matter if one guy is descended from Tarzan and can complete the tire swing in ten seconds. Everyone in the team has to complete. If someone is struggling, you need to figure out how to help them. Perhaps one of the most interesting games involved this cross hatched net of elastic wires, which you basically had to launch yourself into and then crawl through, while not touching the floor below. If you follow this blog, you’ll know I’m a sizable guy but my two teammates are quite short, light women. For them they could just slither down fairly low, the elastic barely stretching under their weight. Me, I was a liability. I had to get as high as I could just so I didn’t immediately hit the ground once I put my weight on the ropes. Nightmare. By the time I got through I’d taken up well over half of our time. But once I was through, all my teammates needed to do was get about half way, and stretch their arms out, at which point I could grab hold of them and pull them through in seconds. It’s those instances where TepFactor really shines, where it basically says “none of you can do this alone”. There are flaws: some of the games are bad and some are just a bit dull, but the best ones are terrific. What happened about the rest of the Prague trip? I couldn’t find anything about the other games you played over there. It’s still on the way. Time to work on the site has been quite limited this year so I’ve focused more on the UK content (not that that isn’t months behind also) but the Prague stuff is in various states of draft. It’ll happen at some point!